Parker Jack Knife Pneumatic? Whaaaaat? I recently picked up this Parker 5 sized pen from an estate buyer on ebay. He lives 250 miles from Janesville, not like that is really pertinent. I wanted to get your opinions on this pen before I pipe in myself. Whadaya think? And here is a photo album of my pen. Well I suspect that's a remarkable find, while I lack any real knowledge of Parker from this era ( this lack isn't confined to Parker or this era either!!) I haven't seen anything like this before. From your first photo I'd not have given it a second look, just another old BHR button filler!! I look forward to what the people with real knowledge have to say on this one. I find the patent date of '29 and the barrel of '12 of interest, to me raises the chance this was an experimental/prototype pen that didn't make it into production. Edit to add: I bet the sac didn't compress as per the patent !! As a Parker novice, I'll only say that I am very much looking forward to seeing what David N. has to say about this pen. It certainly seems to be an very interesting acquisition. When this pen was up for auction, I had some concerns about it. My primary concern was that I thought it unlikely that an experimental filling system being developed in 1929/1930 would have been developed on plastic stock, not hard rubber stock that hadn't been in production for years. When you look in the Duofold and Vacumatic books, you'll see other prototype filling mechanisms that were being developed at that time, and they're all in plastic stock. I guess it's possible that William Moore experimented on his very own Jack Knife initially, but there's a lot more research that needs to go into this one before declaring it a Parker prototype or an aftermarket workshop special. George, have you talked to the seller to try to track back the lineage of this pen? "Positive attitude makes for good decisions, but bad decisions make for great stories." I wondered why it was a JKS, until I looked at the patent. If we are assuming that Parker must have used plastic with a streamline design, then why does the patent, which was filed in1929, use JKS blindcap design and a JKS section? Also, I will need to take a photo of the barrel towards the blindcap end; the thickness of the barrel is thicker than that of a duofold sr. barrel at that point (If anyone has a broken 5 JKS barrel, I would love to see the end of it cut to see thickness of the barrel). 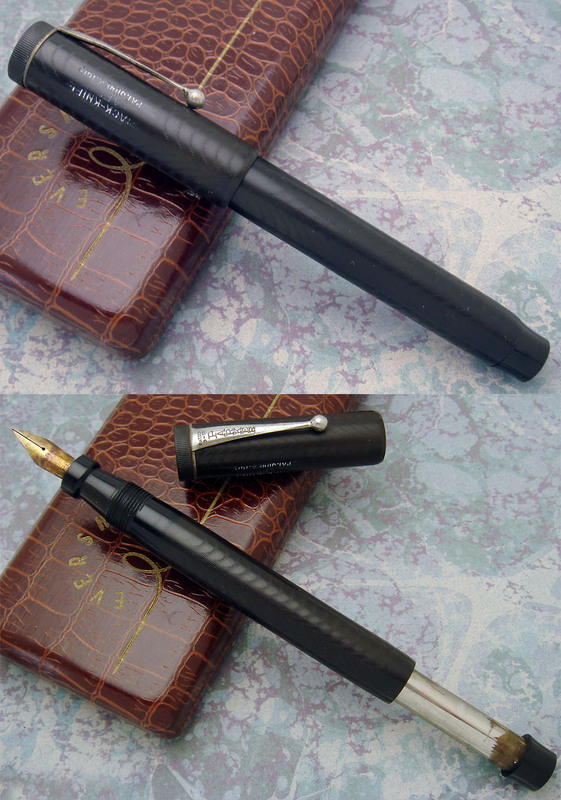 As for calling it a proto-filling / experimental pen, I will wait until the verdict is in to call it anything. Right now, it is just pieces of hard rubber and metal. As for it being an "only one know" pen made by a tinkerer, I have pictures of another that is smooth that is in a private collection, and know that a prominant pen maker/ ex Parker worker from Janesville sold one about eight years ago as a pneumatic non production pen (it was smooth, possibly the one in the private collection above). I wondered why it was a JKS, until I looked at the patent. If we are assuming that Parker must have used plastic with a streamline design, then why does the patent, which was filed in1929, use JKS blindcap design and a JKS section? The patent shows a flattop design that was not only used for the JKS but also for the Duofold up through all of 1928, so that's what I would expect to see in the patent. I only pointed out my concern based on hard rubber pens not being manufactured beyond 1925/1926. But we're both just speculating. It will be good to see the results of further research. That's a great question! I didn't have an answer, so I did a bit of searching. It appears that the first time that the streamlined pen form was used in a patent that was granted to Parker was 1892181, which is the patent for the "Pen Parker" desk base. It was filed and granted in 1932. Right after that you have the Dahlberg patent (1904358) for the filling mechanism that was refined into the Vacumatic filler, which shows a blind cap and section that has the similar look of the streamlined pens. The Dahlberg patent was originally filed in 1928 but the iteration that was eventually granted was filed in 1933. IIRC, you can file updates/amendments to a patent request during the evaluation process. I handled the pen in DC, I believe it to be the real deal, it is definitely a Parker produced piece, I would only figure that they had an unfinished JKS barrel laying around in a parts bin, and decided to fit the experimental filler to it. 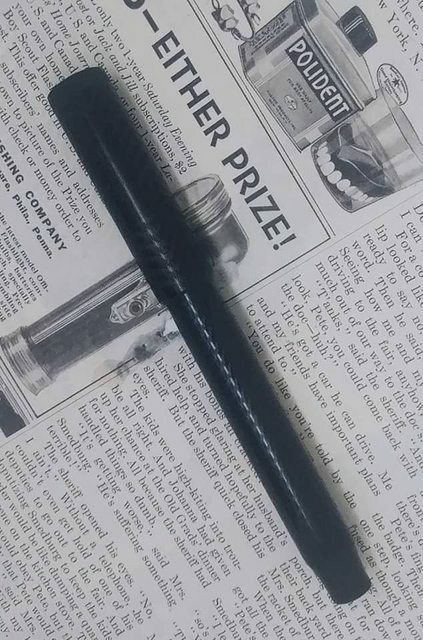 Or even another possibility, maybe this thing was made earlier than the patent, and Parker just decided late of 1929, to patent it to protect it from another pen company using the design, say... Chilton? it is exactly the same as a chilton filler from the long island days, and the parker patent predates the chilton patent by a year or two. I just wonder why Parker didn't go after Chilton to protect the patent, and to another extent, Sheaffer? It would be cool to see if it would work with a new sac, but I doubt I will risk trying to open it. 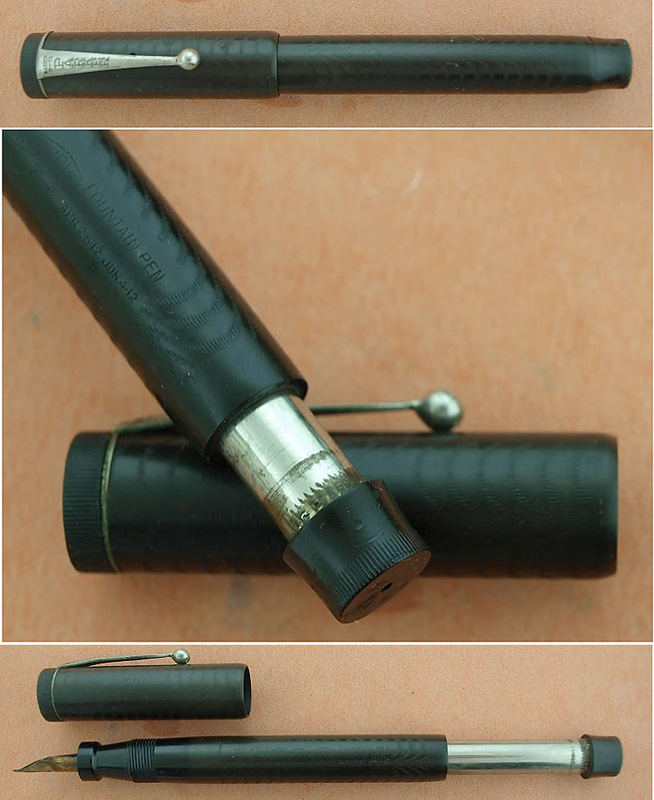 Does anyone have any more info or insight on this pen? I plan on writing an article for the Pennant about this pen, and any help would be greatly appreciated. 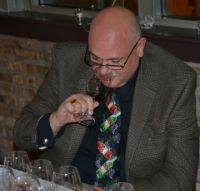 Actually, the mechanism of the patent is different than that of the LIC Chiltons. The key feature is a porous packing unit at the rear of the barrel. So, air compresses under pressure and is slowly released through the porous packing gasket. The Chilton packing gasket is airtight, more or less, and air is released through the finger hole in the end cap (most variants). The self-release of air most closely resembles the Chilton variant where the end cap is loose and is pressed to the metal barrel on the downstroke, or the Seth Crocker filler where the same thing is accomplished by an internal gasket (at least when either of those mechanisms decides to work). Note that although there is no hole in the end cap in the patent, there is a hole present in the end cap of the actual pen. This suggests that, like some of the Chiltons/Seth Crockers with the mechanisms mentioned, the JKS was converted to the LIC Chilton style mechanism, which would allow use of a non-porous gasket, since the finger release would allow air pressure to escape. If the hole in the end cap of the pen is an integral part of the filler, it is not the filler in the patent. Not to necro this thread, but I recently turned up another example of this pen in the wild. They're still out there. Nice to see your pen together with the other one in this thread: I notice that the blind cap of your pen seems a bit longer (normal length of a Duofold blind cap) than the one that George and David show.